Double Door has frontage on Milwaukee Avenue and Damen. WICKER PARK — Ald. Joe Moreno (1st) wants to change the zoning on the Double Door's building to one designed for low-traffic streets — somewhat of a paradox for the bustling Milwaukee, Damen and North avenues intersection that the music club has anchored since the mid '90s. Moreno introduced the proposal to the City Council in April, city records show, amid the ongoing legal battle between the owner of the building and the owners of the club itself. Moreno did not return requests for comment, nor did Sean Mulroney, co-owner of Double Door, or lawyers for Brian Strauss, the building's owner. The 113-year-old building has a zoning designation that is intended to spur development in a commercial corridor, according to Second City Zoning, a nonprofit app that says it uses data "to make Chicago's zoning code digestible by humans." The change proposed by Moreno would zone the building to accommodate retail, service and commercial uses, according to Second City Zoning. It would restrict smaller studio apartments or Single Room Occupancy on the building's upper levels. There are 11 loft-style apartments above the Double Door. A zoning lawyer who is not connected to the Double Door said the change proposed by Moreno "is generally done to prevent or further restrict something that is not wanted." 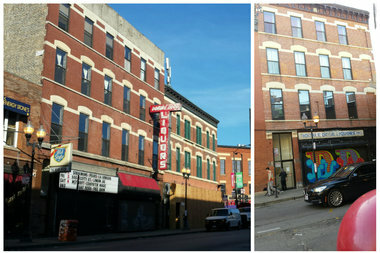 Strauss has been trying to evict Double Door since late November, after the club's lease expired. The ongoing case, after five months of hearings, escalated to a trial last month. There has been no resolution; the group's next appearance before Cook County Judge Orville Hambright Jr. is set for June 14. 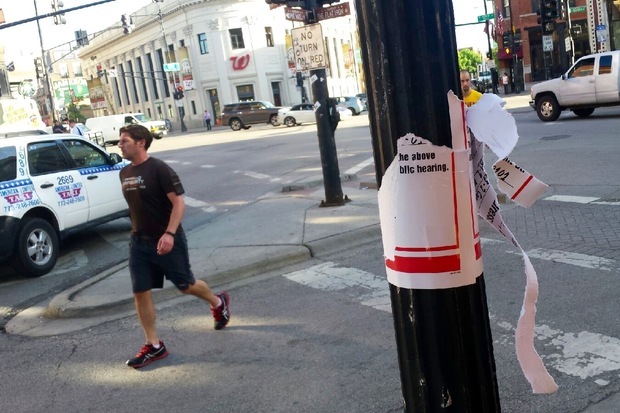 On Thursday, three of four public notices about the proposed zoning change, which appeared on Wednesday affixed to street poles on the sidewalk in front of Double Door, were partially torn down. Only one notice was clear enough to read. Notices are typically posted shortly after ordinances are introduced, but in this case, though Moreno filed the zoning change on April 13, the signs informing the public did not appear until this week. The unique Double Door building, which wraps around the Milwaukee and Damen avenue corner, has a door at 1570-72 N. Milwaukee Ave., and at 1551-59 N. Damen Ave. The club's first floor and basement are listed for rent, according to a commercial real estate listing, which is asking $450,000 annually for the 5,000-square-foot first floor, and $100,000 annually for the 5,000-square-foot basement. That would put the asking monthly rent for the first floor at $37,500 and the basement rent at $8,333. The rental listings come after a deal fell through for Speedwagon Properties to buy the building. The purchase agreement was struck on Dec. 23 but was canceled on Jan. 26, county records show. In January, Double Door co-owner Joe Shanahan told Tribune rock critic Greg Kot, "We've done the Rolling Stones, the Smashing Pumpkins, the Flaming Lips, Greg Dulli and so many important artists there. It supports the community. We want to stay." Double Door opened in 1994.